I was thinking I saw everything on home decor and especially kitchen design, but when I saw this project I was literally out of words. First thought was – it’s ridiculous, but when I started thinking about the design and purpose I had to admit, that If this is already done, then someone must have liked it. It looks like the furniture is tufted and in cream glossy leather. I’m not sure , but these must be crystals all over it and I can bet they are Swarovski. Backsplash is also in the line of everything else – glossy and shiny. 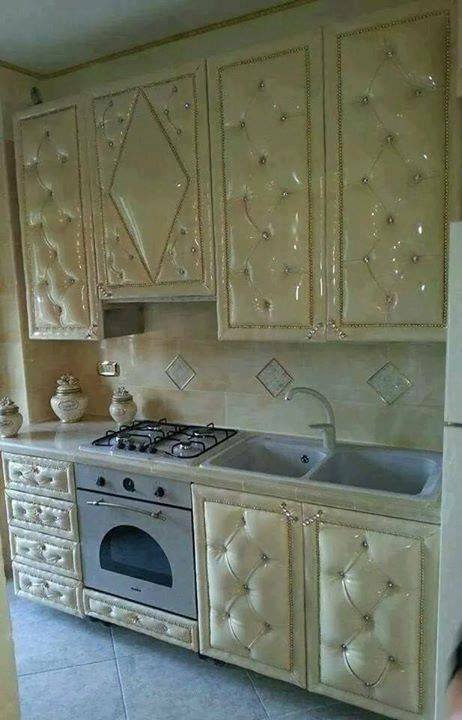 The stove though is not good enough for this design, I’m sure they could get a better one – at least in the same color. What about the floor tiles – again, boring and cheap. My honest opinion is – this design is made for someone which is not wealthy enough, but wanted to look like one. In the end – it looks cheap and grotesque.